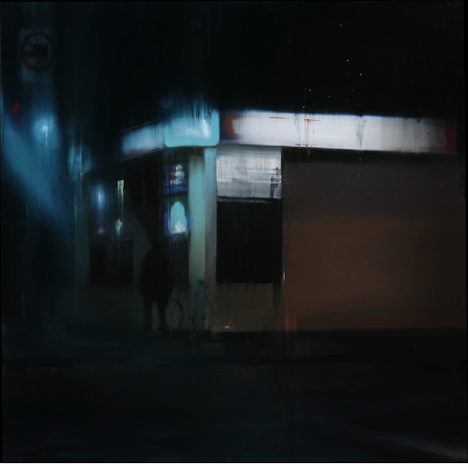 The Outsiders, the emerging art gallery from curator-director Steve Lazarides, presents ʻWaiting 101ʼ a solo exhibition featuring the newest works from Brett Amoryʼs internationally acclaimed ʻWaitingʼ series. American contemporary painter Brett Amory is widely considered one of the breakthrough artistic talents of the past year. He is best known for his Waiting paintings, a body of work that has spanned the last decade documenting figures and landscapes in the Bay Area. The new collection ʻWaiting 101ʼ debuts at The Outsiders Gallery in Newcastle, UK on April 19th 2012. The compositions in the exhibition focus on Amoryʼs newfound relationship with technology, and the implicit freedom it allows in his work. Delving into documentation methods which new modes of ambulatory technology offer, Amory experienced a metamorphosis in his painting preparation and application. With intimate, firsthand knowledge of the many ways that technology can affect the lives of those it touches, Amory explores the avenues itʼs opened up for him as an artist in ʻWaiting 101ʼ.